The crypto space appears to be finally shaking off the bear market blues today as $16 Billion suddenly floods back into the market, and Bitcoin’s price jumps by nearly $1,000 in 2 hours (05:00-07:00 UTC +1, this morning). Not only has the meteoric rise pushed BTC dominance back over 51%, but it has also helped a vast majority of the altcoin market bank double digit gains against the US dollar. While the reason for today’s sporadic Bitcoin boom is not entirely obvious, here are a number of factors that are likely to have played an important part in initiating this morning’s surging bull run. Yesterday, Bitcoin’s price action returned to test the main resistance of a 4-month ascending triangle pattern for the 5th time, after making consistently higher lows from February 8 (see image below). 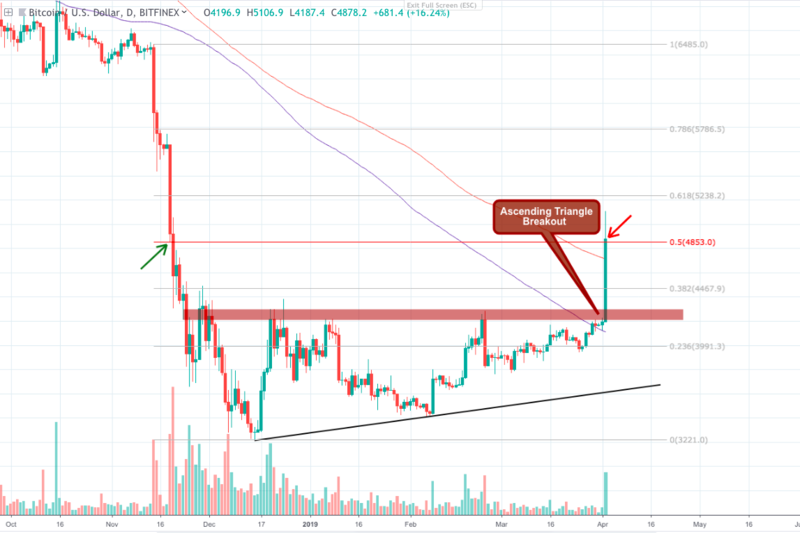 On March 29, BTC closed above the 150 SMA for the first time since July 31, 2018 (see below) which was an early signal that strong bullish momentum was building behind the asset. Once BTC broke over the resistance at $4,300 and continued to rise, it created a huge short squeeze on the Bitmex Bitcoin Futures market. The squeeze forced a large number of short traders to sell their positions at a loss and many will have bought up BTC to cover their shortfalls. 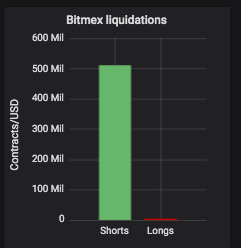 So far it’s been estimated that over $500 million worth of BTC Futures contracts have been liquidated in the last 24 hours. On the 1D BTC/USD chart we can see that the price action had been making consistently higher lows since returning to the uptrending pattern support on February 8. 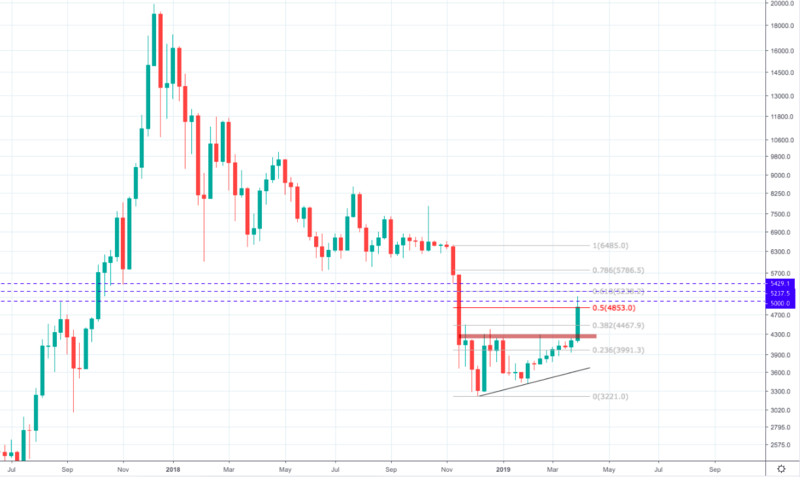 After retracing back to the 0.236 fibonacci level at $3,991, Bitcoin bulls began to eye the main pattern resistance above between the $4,200 and $4,300 price levels. In 5 days, BTC buyers were able to close the gap and retest the breakout area for a 5th time in 4 months; with little to no selling pressure from bearish traders. During the explosive breakout that followed, BTC was able to clear through the 0.382 and 0.5 fibonacci retracement levels with relative ease, but lost momentum after passing over the psychological $5,000. Autobot trades, short-term profit takers and panic sellers quickly turned the tide of the trend, and forced BTC to correct back down on to the 0.5 fibonacci retracement level at $4,853. Right now it seems that the asset is likely to hover around the 0.5 fib level and the 200 SMA support below - which has been surpassed for the first time since BTC closed beneath it back on May 12, 2018. From there we could expect a second impulse movement to begin once the asset has established a support, as bullish traders attempt to reclaim the $5,000 level. Looking at a number of indicators over 1H candles we can see that the trend is still favourably bullish despite the $210 pullback from this morning’s high at $5,105. The indicator line on the Chaikin Money Flow has returned above the zero line after briefly passing beneath it. All ROIs are calculated from the asset’s current value at $4,870.